Enter the world of Valiant Entertainment! The Valiant Universe has been reborn, and heroes X-O Manowar and Bloodshot are back in monthly comic-book adventures. 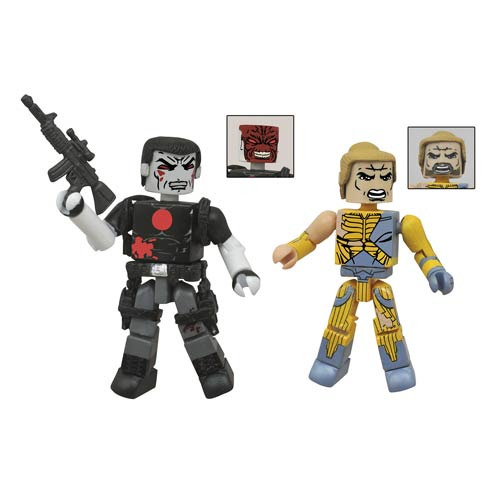 Kick off your collection of Valiant heroes with this Valiant Bloodshot and X-O Manowar Minimates 2-Pack. X-O and Bloodshot are fresh from a skirmish… maybe against each other! Each 2-inch mini-figure features 14 points of articulation, as well as interchangeable parts and accessories. Packaged in a full-color blister card, they're designed by Art Asylum! Ages 8 and up.